Blink cameras work well and come at the right price point for what they offer. But, since they depend on Wi-Fi and are short on features, we didn’t feel like we could take them seriously as a true security measure. 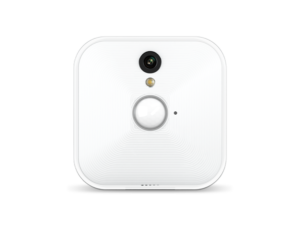 Blink’s cameras are inexpensive and wireless, which makes them an intriguing possibility if you’re looking for a quick and easy way to improve security in your home. We reviewed both the basic Blink camera and the Blink XT to determine whether or not they’re a viable option for people looking for more home security. Overall, the cameras are affordable and functional—but pretty basic when it comes to features and security performance. Keep reading to learn more about what we thought of them—and to find out what my cat does while I’m away from home. 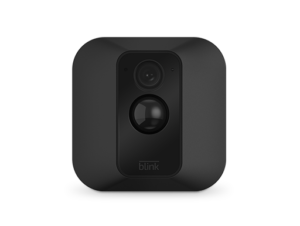 Blink offers two cameras—the basic Blink Indoor Camera and the Blink XT Indoor/Outdoor camera. These cameras stand out because they are wireless, come at an affordable price, and include free cloud storage. The cameras don’t work without the sync module (which manages the cameras and sends them instructions), but you can connect up to 10 cameras or accessories to one module. The sync module is the only device that needs to be plugged in, so it makes it easy to install these cameras just about anywhere in your home. 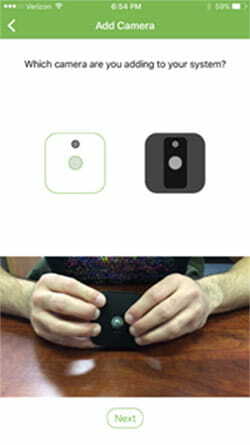 Blink cameras come with motion sensors. If your system is armed, the cameras will record a video when the motion sensors are triggered and send an instant alert to your phone. You can check the app to see the video clip. Your account comes with enough free storage for up to two hours of video. The default length of clips is five seconds, but you can adjust that in the app. Once you’ve reached the storage limit, the oldest clips are removed to make room for new clips. 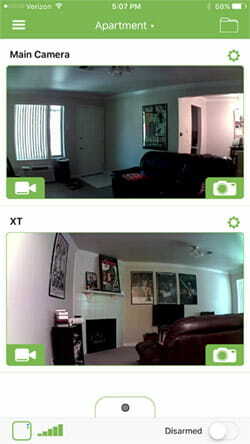 We tested out the Blink indoor camera and sync module with an add-on Blink XT camera. Everything was easy to use and worked as expected. Setting up the Blink camera system was pretty quick and easy. The pamphlet that came in the box walked me through all the steps to get the first camera connected to the app. Once I created an account and downloaded the app, the app explained the rest of the setup process one step at a time with clear instructions and visuals. It took a few minutes to get the sync module connected to my Wi-Fi and to get the account set up, but I had no issues and adding the Blink XT camera took less than a minute. Once the cameras were set up, it was easy to control them with the app. You can use the app to arm and disarm the motion sensors, change the sensitivity of the motion sensor, tell the cameras how long to record clips when the motion sensor is triggered, and adjust the intensity of the low-light illumination. The app also lets you set schedules for when the system will be armed so you don’t have to remember to turn it on whenever you head out for the day. well, but the differences between the sensitivity levels didn’t seem significant. My cat set off the motion sensor frequently while it was set at the highest level, but she also set it off at the middle default level. You can also use the app to see a live view of your home anytime, whether or not the system is armed. If you want a closer look, you can zoom in on the live video or on recorded clips. I recently went out of town for a quick trip, and it was nice to be able to check in on my apartment periodically, even when the motion sensors hadn’t been triggered. The automatic settings for both cameras work well. When I came home late at night with the lights off, the base camera’s LED illumination turned on and the Blink XT’s infrared night vision came on. Both cameras recorded clips that had pretty clear video. Blink has lots of information online in its FAQ section, and I found answers to most questions I had there. I did have a few questions that I couldn’t find the answers to online, so I emailed customer service. They responded within minutes with a personalized, thoughtful, detailed answer. Although I would like to see Blink offer customer support over the phone, I was impressed with the online resources and the incredibly fast email response. What else would we like to see from Blink? Blink cameras work as advertised and are a good deal for the price, but Blink falls short in some areas. In the future, we’d like to see a few improvements. 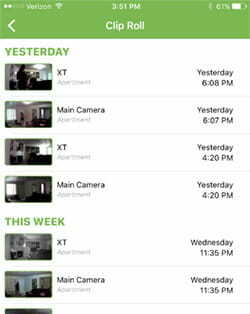 Right now, you can check in on your home whenever you’d like, but you can’t tell the cameras to start recording if they aren’t triggered by the motion sensors. We’d like the option to record from the cameras on demand. If you want to stay in live view for more than 20 seconds, you have to hit the Continue button and continue to hit it every time 20 seconds has passed. We’d like the option for continuous live view, or at least a longer stretch of time before the feed times out. Blink’s app is easy to use, but a lot of the resources in the app open in a browser once you click on them. We’d like things like FAQ information and customer support contact forms to work within the app itself. Blink cameras aren’t always recording, but they are always on. It would be nice to completely power off the cameras on occasions when you want extra privacy. Blink cameras have no internal storage. If your Wi-Fi connection isn’t working, it means that the cameras are essentially useless. We believe the cameras would be more valuable if they could store clips themselves—even if the internet connection was down. Overall, users seem pretty happy with Blink cameras, and they’re impressed with how easy the cameras are to set up. Critical reviews are concerned about limits of the live view feature and the potential security issues that come from a system that relies on a Wi-Fi connection. Ediing the review after just one day of use, taking away one more star. The Blink’s server went down today evening, staying down for hours! To make things even worse, the sync module didnt reconnect to the server after that downtime, i had to physically (!!!) reboot it to get it bsck online. This is a SHOW STOPPER, the entire point of those cameras is to stay online and ready while noone is there!!! I am now powering the sync module from a router USB port, which i am able to power cycle remotely, as a (bad) workaround. My current recommendation – stay away from this little thing, as nice as the idea may be, the implementation is unreliable, and thats important. Do we recommend Blink cameras? Overall, we were pretty happy with Blink cameras. They are easy to use, don’t cost a lot, and work as expected. However, even though the cameras work well, they don’t offer enough when it comes to security. They aren’t monitored, they don’t have on-device storage, and they don’t come with two-way audio. If your priority is security, we’d recommend a more established company with more features—even if that means spending a little more. ASecureLife.com recommends choosing a monitored security system (for example, systems from Frontpoint or Vivint) whenever possible. If you don’t want a monitored system, we’d recommend a camera-based system with more capability and more integration with other products. Piper, Canary, and Nest all offer more than Blink. If, however, you’re looking for something that is simple, portable, and very inexpensive, Blink cameras could be a great option. They offer some rudimentary security at a low price. Have you used Blink cameras? Let us know how they worked for you in the comments below!